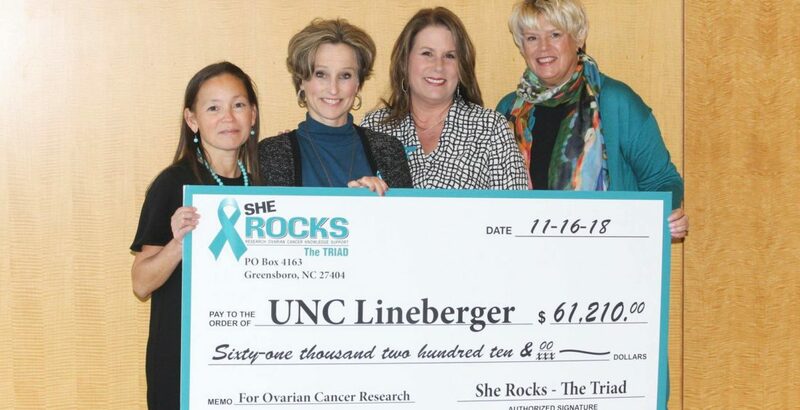 At UNC Lineberger Comprehensive Cancer Center, Marie Wood, Martha Pfeiffer and Marsha Tice of She ROCKS the Triad presented a $61,210 check to Vickie Bae-Jump, MD, PhD, to support her ovarian cancer research. The TRIAD is on the way to deliver the first of many donations to come for Ovarian Cancer research! Thank you to our community for making this happen! We will make a difference by funding better methods of treatment for this disease.